Lovemore is about love, but not just the flowery fuzzy kind. The two explore all the nitty gritty aspects of the powerful emotion, using both their own songs and some covers, sharing their own experiences and reasons for using songs along the way. They explore different genres, with some good ol’ blues, a little soul, a touch of folk and some country. The intimacy and sincerity of their performance, along with their on stage chemistry, gives the feeling of eavesdropping on a private moment, reminiscent of watching a performance by The Civil Wars. From songs about heartbreak and longing to cheeky songs like Luna’s “Wildfire” and the cute and fun, “Can it be”, Lovemore will rip your heart out and then make you fall a love again, all in one evening. While they are taking some time to concentrate on solo shows, Gerald and Luna will be performing Lovemore in Cape Town, as requests come in. There is also talk of the two recording as a duo early next year and I for one cannot wait to take a piece of Lovemore home. Gerald and Luna will be at Alma Café in Rosebank on 24 November with their Lovemore show. Call 021 685 7377 to book. The moment I stepped into The Mahogany Room, I stepped out of my comfort zone. A far cry from dusty farms with hordes of rock fans, and giant stadiums filled with EDM artists’ flashing lights, The Mahogany Room is a small, cozy and dimly-lit venue that is inherently warm and inviting and dominated by jazz. It is a place well-known for giving jazz artists a creative base in the Mother City, for giving artists the platform to share their art with an appreciative audience. Of course, it embraces the past as well: while enjoying a drink at the bar, I took some time to gaze at the striking black and white portraits of famous South African jazz artists that pepper the walls of the room. Some of these photographs, I was informed by the friendly bar staff, were taken years before when many of these artists were in exile abroad. As much as I wanted to delve into more of the history, I was not here to look at pictures, and surprisingly, neither was I here to listen to a jazz set. The Spring Lovemore Show is a delightful collaboration between two talented South African musicians and singers, Luna Paige and Gerald Clarke. Paige and Clarke began collaborating in 2011, and their pairing of beautiful vocals and slick instrumentals proved to be a winning combination as the pair embarked on a successful national tour in 2012. With that in mind, I was ready to be serenaded by a blend of soulful blues, foot-stomping country and emotional rock ballads. The Mahogany Room promises intimate performances, and proved to be the perfect platform for The Lovemore Show, which is all about (you guessed it) love. Luna Paige and Gerald Clarke take their audience on a journey to explore love in all its nitty-gritty aspects, from the heartache of letting love slip through your fingers to the fear of commitment, from cheating lovers to newfound giddy passions. “I’ve got nothing to hide,” Luna confides, and indeed these performers don’t hold anything back. Luna and Gerald sprinkle their performances with little anecdotes, giving us a glimpse into the emotions and stories behind each song. It infuses their performance with a particular passion, and gave me the feeling of being more like a confidante than a listening audience. The Lovemore Show is so intimate, it is almost impossible to imagine it on a big stage, which makes it more than suitable for the cosy confines of the Mahogany Room. The Lovemore Show is a mix of covers and original works. The cover songs include famous hits from artists such as Robert Plant, Alison Krauss, Johnny Cash, June Carter, Kid Rock, Sheryl Crow, Willie Nelson, Norah Jones, Etta James and Neil Young. One of the songs to listen out for is Kid Rock and Sheryl Crow’s ‘Picture’, a tale of cheating lovers that Luna and Gerald deliver with an explosive energy that is impossible to resist. Of the pair’s original songs, ‘Wildfire’ is arguably the most evocative. A tale of muses and inspiration, the story takes an unexpected and heartfelt turn when inspiration sours and irritation sets in. Most of us know the feeling of frustration when you just can’t get someone out of your head, and Paige brings that emotion into life with achingly well chosen phrases. As a duet, Luna Paige and Gerald Clarke form a stellar duo. Great vocals, an excellent choice of songs, and Clarke’s fantastic ability to make his guitar truly sing, all combine to deliver one seriously impressive package that deserves to go far. Page through this magazine. You will find Luna on Page 6-8. Happy reading! 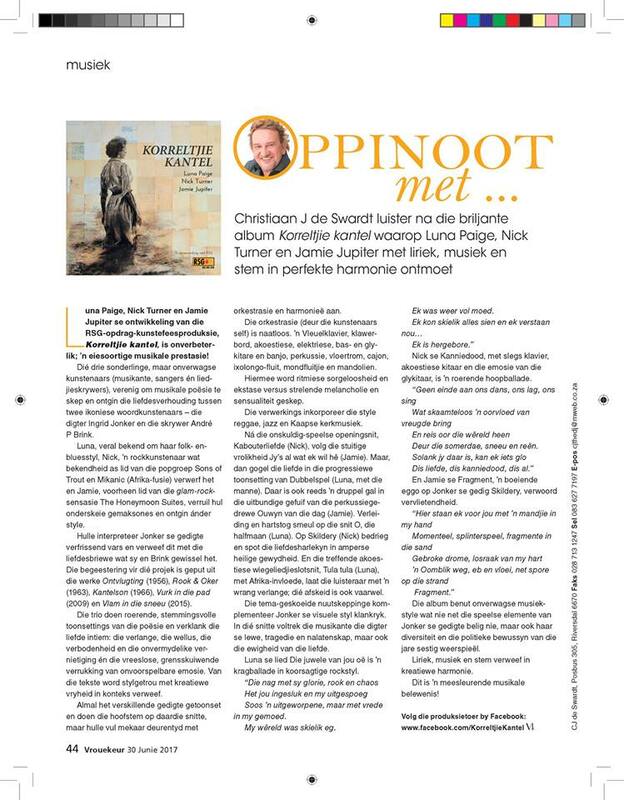 For those of you who understand Afrikaans, click here to read this Afrikaans review of the Storielied DVD and CD. Although I’m Irish, I’ve lived in South Africa long enough to learn Afrikaans and I speak it fairly fluently, as I do Zulu. That being said, the number of Afrikaans albums in my rather large music library is limited. 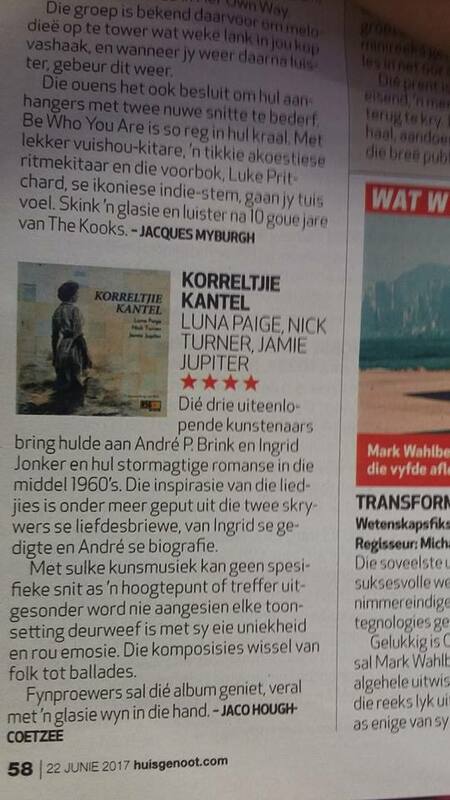 So I wasn’t sure if I would be the right person to review Luna Paige’s first Afrikaans album, Storielied. But I’m glad I did. 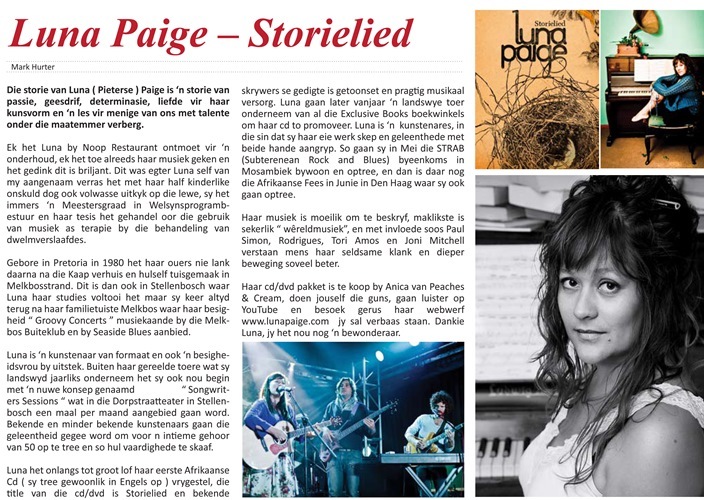 Luna has done three English albums, but Storieleid is her first Afrikaans one. 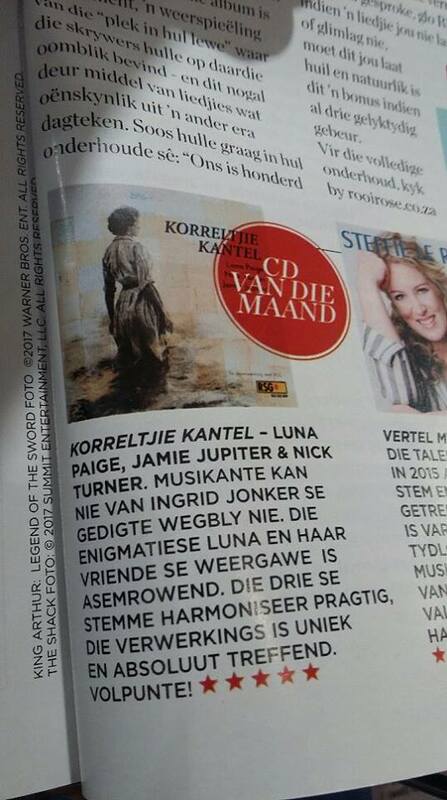 And let’s hope it’s her first of many Afrikaans albums. This is by far the best Afrikaans album I’ve listened to this year. I’d even go as far as to say that Storielied would be in my Top Ten of all the Afrikaans albums I’ve ever listened too. Luna’s voice is both sultry and haunting. She could sing the telephone directory and make it sound good. Storielied consists of both an audio CD and a DVD of a live performance. 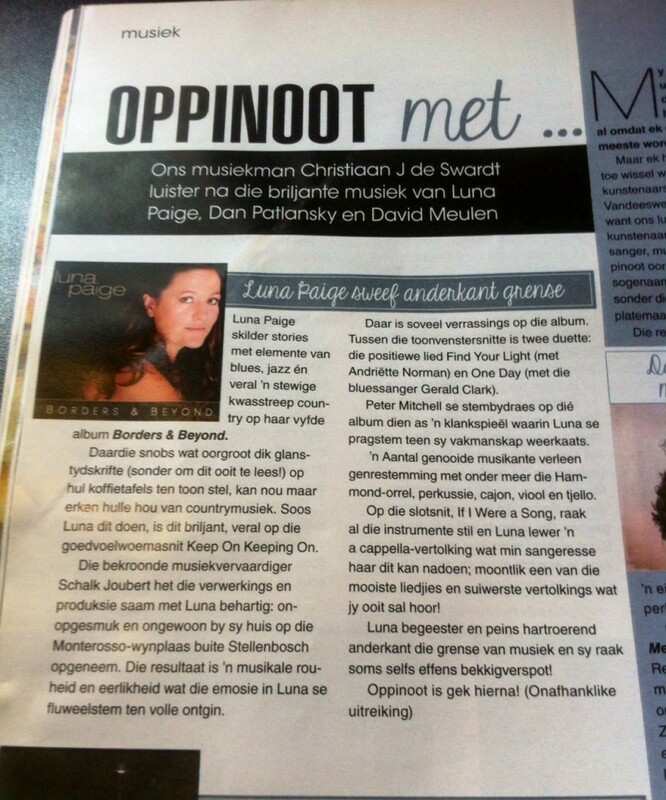 The majority of the songs, written by Luna, are based on novels, shorts stories and poem by Afrikaans writers. It’s a brilliant concept and it really works well. With Luna on piano and guitar she is backed up by a big-band sound that includes bass, electric and acoustic guitar, violin, cello, trumpet, drums, percussion and even an accordion in one of the songs. The lyrics to the songs have a ballad feel to them, something I’m crazy about. Listening to her on piano and vocal reminds me of Billy Joel. She’s that good. 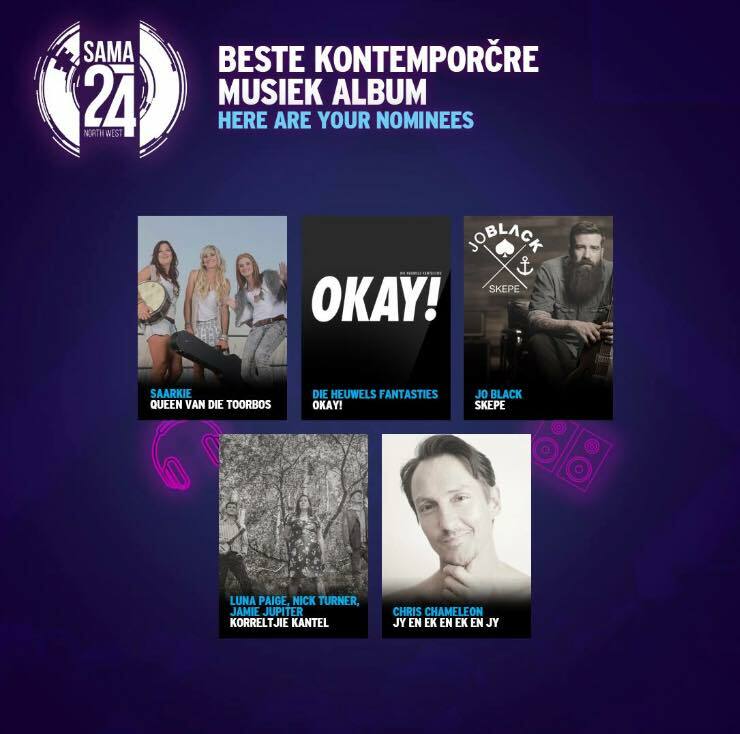 My favourites on the album include Altyd Kom Die Somer Weer, Die Juwele Van Jou Oe, Die Oerdans and the catchy Breek My Oop. Listen, even if you don’t understand a word of Afrikaans, get this album – you’ll understand the music. You can order the album at Luna’s website. Luna hooked up with the editor of the Hipe Magazine in December 2012. This online magazine is aimed at providing some food for thought for the youth of SA. What makes this magazine extra special is that they encourage the youth to become involved as journalists themselves. Check out this great article by Matt Tennyson and flip through the magazine. If you’ve ever heard Luna Paige sing, you won’t forget her. She has one of those remark- able voices that leaves an imprint that lingers. A local singer/songwriter, this plucky lass with the honey-drenched voice recently launched her latest album, Storielied. 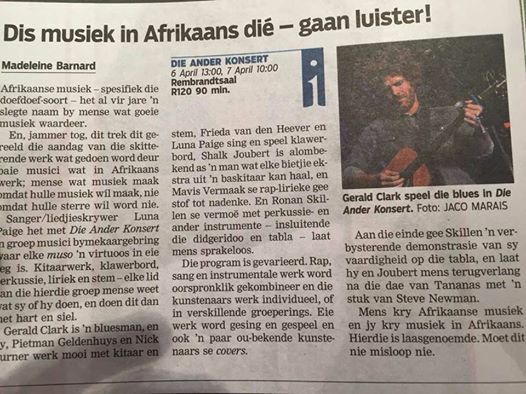 Using Afrikaans literature as her backdrop, and teaming up with hotshot guitarist Schalk Joubert, this is one for musical bookworms. For many years, this Afrikaans performer has neglected her home language, preferring to write and perform in English, and her three albums to date have all been in the country’s lingua franca. But then she was asked to perform at Stellenbosch’s Woordfees using short stories and novels as reference for songs which is where the bug bit her. She liked searching for her own stories hidden in those of other writers and knew that all of this, from either side, the writer and the songwriter, would be open for further interpretation. Sometimes, something she read affected her, or jogged a memory which would then give her a way into a song. 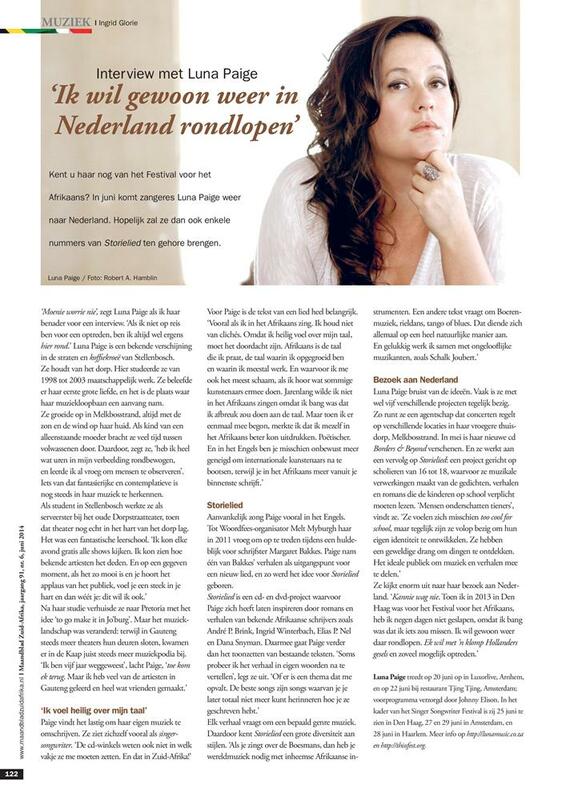 It wasn’t easy because for too long, her songwriting was done in a specific language and to switch your head can be tricky. But she did. Something she also liked was the fact that sometimes the songs would lead people into the books. The choice was not an easy one, but she was driven by time restrictions as well when selecting books and writers. But play the album and it’s fascinating how Luna’s voice dominates. She has a quality that keeps you mesmerised and listening even if you don’t understand the language. Of course it’s better if you do, but the music tells its own story. South Africa, she says, is a country of many nations with stories of aristocracy from the North, spices and women of allure from the East and those from here, this earth, have a particular rhythm, knowledge of the environment and scents of the continent, all of whom feature in her songs that unfold stories. She ponders evolution and religion with Ingrid Winterbach, dreams of passion and romance with Andre P Brink, sings about the Koi as described by Elias Nel and dances until daybreak with the freed slaves in Raithby. She also takes an old song from the FAK and makes it her own and writes a few personal stories. 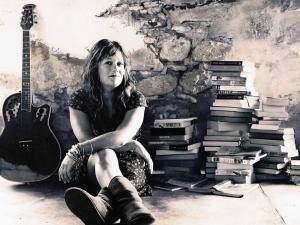 Music has not been an easy business for this determined troubadour, but she keeps coming back. Every once in a while, she steps out and spends a bit of time in a 9 to 5 job just to catch her breath, but even before anyone starts noticing, she’s back. The appealing thing about her is that the music always comes from a place of authenticity. She likes singers like Nick Cave, someone who grabs her by the gut and pulls her into the music. The only thing she’s sad about with this album is that she can’t recreate the big sound on stage. “It’s just too expensive to have so many musicians performing with you,” she says. “It was a 13-piece orchestra that played for the album,” and you can hear that. But what she loved was because of the quality of the musicians, people she knew well, the process was still an organic one. That’s what Luna is about. She wants to touch you in a way that will knock your socks off, but softly. The packaged Storielied includes a DVD with a documentary of the show which is quite awesome, with musicians of amazing quality and Luna in full tilt as a bonus. Her next project is a blues album (in English) and she has been performing with another blues artist, Gerald Clarke (also part of this show) whom she really enjoyed. “Our voices work together,” she says. Collaboration is something she encourages and she’s also been working with songwriter Peter Mitchel, a comedian, which stretches the spectrum for her even further. Luna is an unusual performer who has her own style. From blues to boere baroque, it’s all there and for those who enjoy gentle rhythm and blues, she has her own brand. If you get the writers and the songs, it’s an easy purchase, but even when not, the music works like a charm. 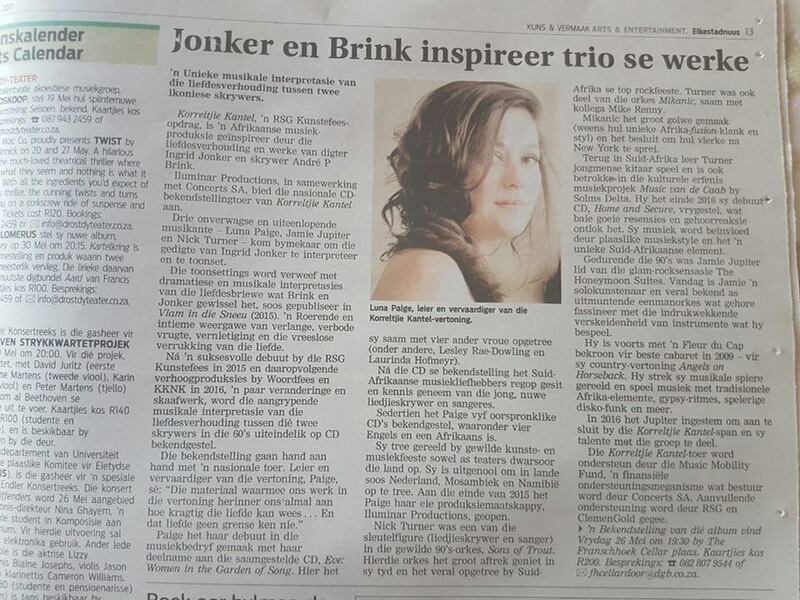 Click on the link below, scroll down to Skrywers en Boeke dated 12 December, and listen.